30-Mar-2008 -- I was awake early on the penultimate day of our 11-day diving tour of the Solomon Islands. The MV Bilikiki — our dive liveaboard — had started her engines and began to move. While getting my morning coffee Sam — the manager — asked me if I was ready to visit the confluence now instead of later and would it be OK to go over it on the big boat? I said yes to both questions and went up to the wheel–house with my camera and GPS. Frank Leki—the Captain entered the coordinates into his GPS and off we went. 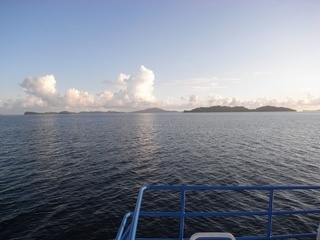 We were moored and diving in Sandfly passage in the Florida Islands the night before. We started a little over 10KM away from the confluence point and it was only a few hundred meters off our intended course to Passage Rock for the first dive of the morning. Frank drove straight to the point, cut the engines and said “soon”. I took the first picture of the bridge GPS as soon as we got to 9°00.005 and 160°00.063. Frank saw me take the picture and said “wait”. We drifted a bit due west and at 6:52 AM we were at 9°00.000 and 160°00.032. Excellent driving for a 120 foot dive vessel! I took the four compass point pictures as best as I could with the big boat drifting. Picture # 1 N - Northern tip of the Florida Islands chain. Picture # 2 E – Florida Islands. Picture # 3 S – Gaudalcanal in the South and Savo Island to the SW.
Picture # 4 W Bow of ship – no land. To the North and East where we were diving is the Florida Islands. In the south is Guadalcanal and you can see Savo Island in the SW. There were many famous battles fought in this area for the control of the Coral Sea and Guadalcanal in WWII. Many US service men lost their lives fighting to keep the area from the Japanese. It is really beautiful here and much safer now than back in 1942. Thanks to Sam from the Bilikiki and Frank Leki for making sure I got to this second confluence in the Solomon Islands. In the ocean, about 3 km from land.